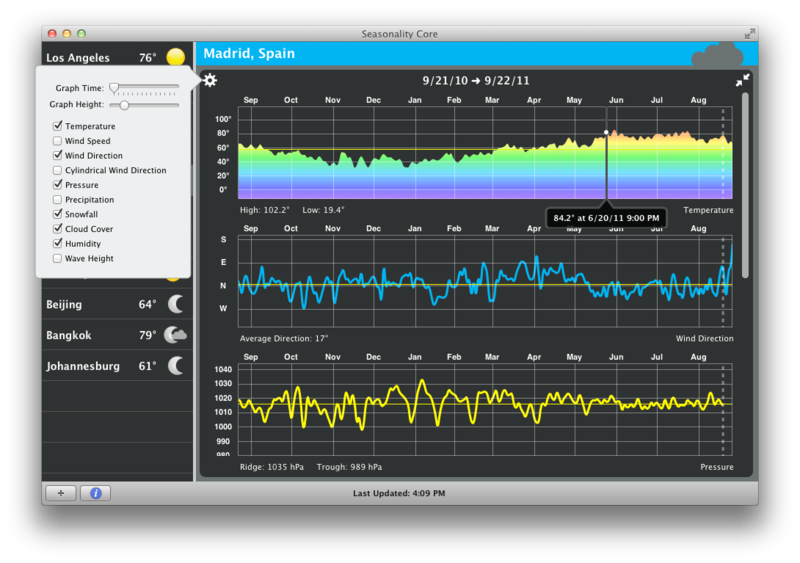 The custom graphing code in Seasonality Core provides a pleasant view of weather observations you won't find anywhere else. Seasonality Core can download up to four days worth of past data, and continues to save data on your Mac as long as it is running. 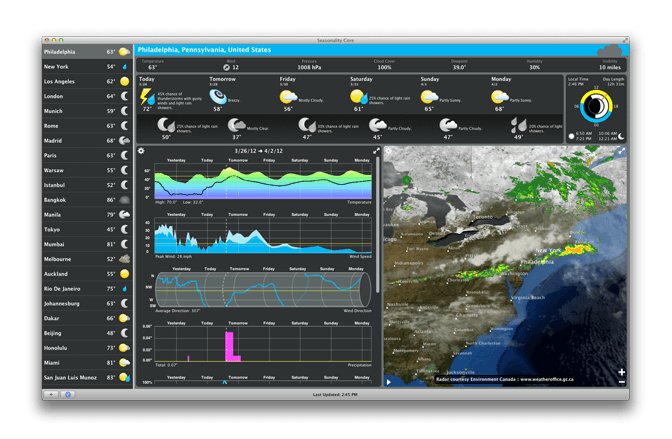 This allows you to watch the weather change from season to season and from year to year. 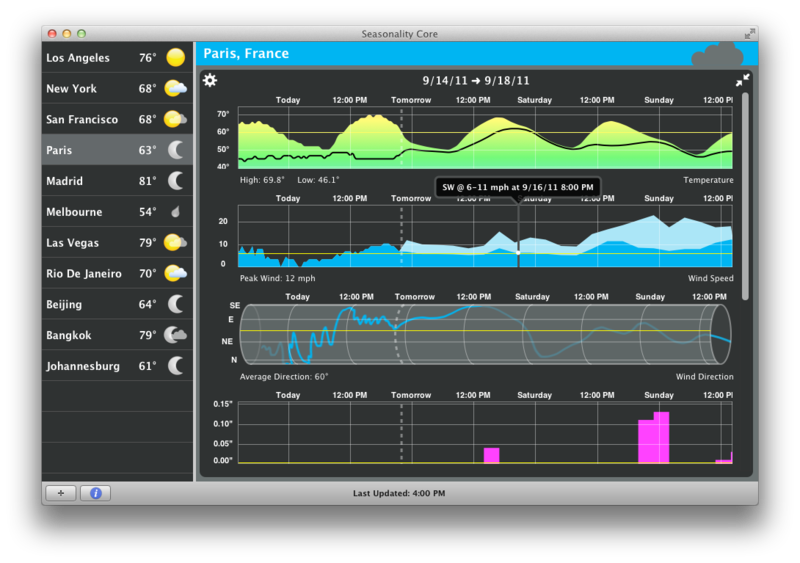 Seasonality Core takes advantage of the all the latest OS X technology to give you the best weather experience possible. 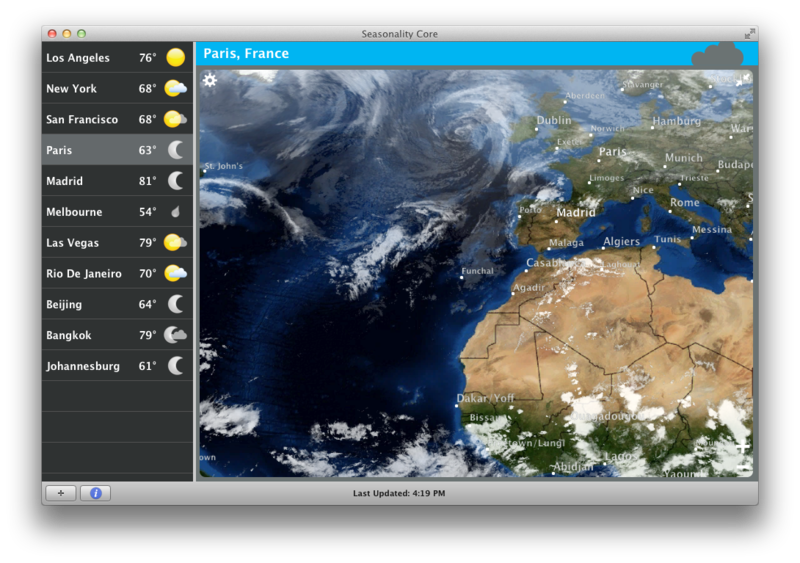 Use the full screen mode in Lion to see a beautiful weather layout without any obstructions. Or choose to just maximize the graphs or map within the window. 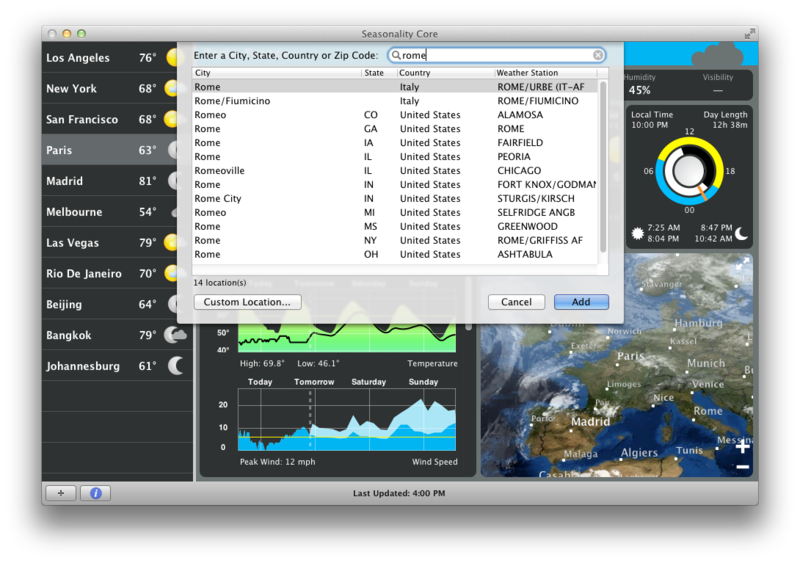 Seasonality Core recognizes gestures to make it easier for you to interact with the data. Pinch to zoom on the map or adjust timelines on the graphs. Use two fingers to scroll through any of the data offered. Thanks to the multiple processor and 3D graphics acceleration support, Seasonality Core is always responsive to your every need. Seasonality Core knows no boundaries. The application comes bundled with over 30,000 locations in over 200 countries worldwide for one-click access. If you can’t find an appropriate location in our extensive database, create your own custom location to get accurate weather anywhere. Thanks to our custom back-end, which has been extensively tested since 2004, we gather, process and track data from around the world. Some advanced features may not be available worldwide just yet but we’ve got you covered with the basics wherever you go. We are also working hard on expanding our coverage, for all our users. While weather data is now available from a wide range of sources, not all tools are equally accurate or reliable. This is why we continuously poll the best possible sources, including the National Weather Service in the United States and similar scientific institutions around the globe. Our own back-end then compiles and prepares the data for broadcast. Because Seasonality offers full details, such as maps, graphs and numerical data, you can delve deep into the information from many angles and understand how it may affect your planned activities. Seasonality Core relies on independent and non-commercial scientific sources for its data which guarantees balanced, complete and continuous reporting. 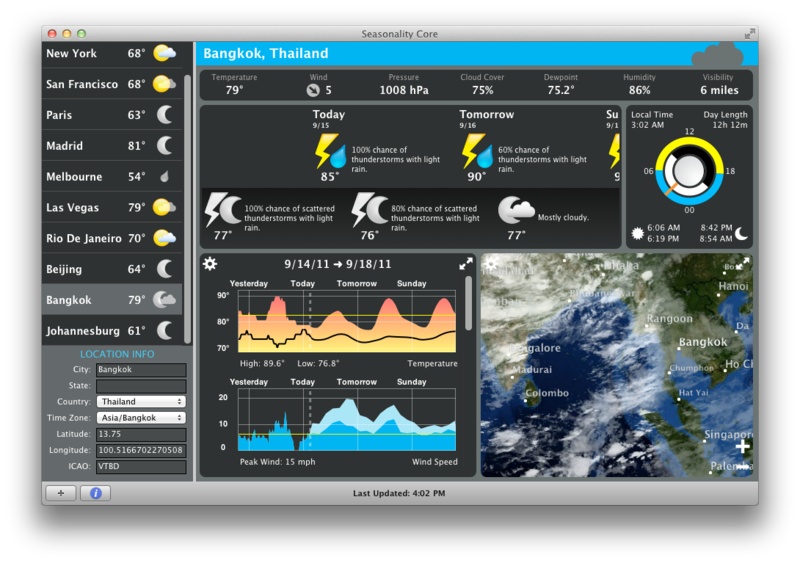 $24.99 gets you today’s most intuitive and advanced weather application for the Mac, as well as access to our famed back-end that downloads and crunches data from all around the world for comprehensive reporting, at no extra cost. Unlike subsidized alternatives Seasonality Core provides ad-free, subscription free access to your data. That means no nags and no recurring costs. Because Seasonality’s data comes from state-operated and research operations, there are no risks of our sources going dark or charging for the content on a whim. Seasonality Core is your one-stop-shop for all your weather needs and curiosities. It's an app you will find to be indispensable. Buy for $24.99 Available from the App Store Download Requires OS X 10.7+. This update is free for all customers. Email or tweet @getseasonality with any questions. We will get back to you within two business days with the answers you seek. 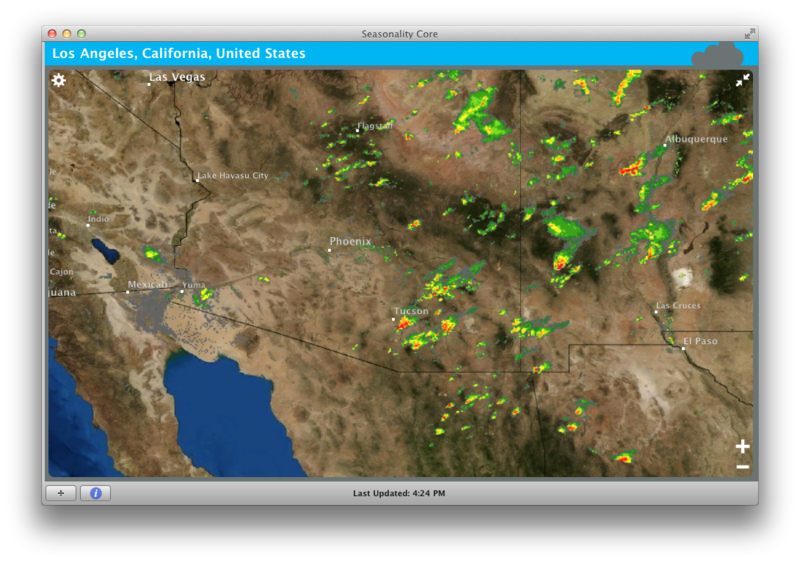 Seasonality Core uses information from reliable sources such as national weather bureaus and research groups. While we strive to offer relevant information in every part of the world, some data can be a bit difficult to come by, which is why some features are currently unavailable outside of the United States, Puerto Rico and Guam. The table below explains what is currently available to you depending on your region of the world. Please rest assured we are hard at work expanding our international coverage. Seasonality Core users start benefiting from new data sets automatically as they go live in our back-end: no paid updates or manual actions are required, so keep a close watch on these graphs! 7 Day Forecast Sourced from the National Weather Service. The continental U.S. is forecasted using a 5km grid, 6km for Alaska, 2.5km for Hawaii and Guam, and 1.25km for Puerto Rico and the Virgin Islands. Sourced from a 0.25 degree GFS model output. In middle latitudes, this results in approximately a 25km grid. Hourly Forecast Sourced from the National Weather Service. Most data is plotted every 3 hours, although some data, like precipitation amounts, is plotted every 6 hours. Sourced from a 0.25 degree GFS model output. All data is plotted every 3 hours. Current Conditions Sourced from the National Weather Service METAR data. Sourced from the National Weather Service METAR data. Astronomical Data Computed locally and therefore fully available. Computed locally and therefore fully available. Radar Imagery Base reflectivity radar imagery covers most of the US. Base reflectivity available over much of Australia and Canada. Radar is not yet available outside these countries, but we are working on the matter. Satellite Imagery Full coverage. Full coverage, except for latitudes beyond 80 degrees North and South because geostationary satellites cannot see the poles. Surface Analysis Full coverage. Available over most of North America and surrounding oceans. Not available elsewhere. Temperature Full coverage for past and future. The forecast is plotted every 3 hours out to 72 hours, then every 6 hours after that. Full coverage for past and future. The forecast is plotted every 3 hours. Pressure Full coverage for past observations, but the forecast is not yet available. Full coverage for past observations, but the forecast is not yet available. Probability of Precipitation Past coverage not applicable. The forecast is plotted every 3 hours out to 72 hours, then every 6 hours after that. Past coverage not applicable. The forecast is plotted every 3 hours. Liquid Precipitation Past observations are covered at many but not all weather stations. The forecast is plotted every 6 hours out to 72 hours. Past observations are covered at very few weather stations. The forecast is plotted every 3 hours for the full forecast period. Snowfall Past observations are not yet available. The forecast is plotted every 6 hours out to 48 hours. Past observations are not yet available. The forecast is plotted every 3 hours for the full forecast period. Wave Height Past observations are not yet available. The forecast is plotted every 6 hours out to 120 hours with full coverage along the Pacific and Atlantic coasts and the Great Lakes. The location must be over water for the graph to work. Coverage is not yet available, but we are working on the matter. Credit to Joseph Wain for his Glyphish Icons and to Rasso Hilber for his Nonverblaster Flash Player.